You may laugh when I tell you that this photo book is only the first book in a two volume series on my honeymoon. It was one way to get around the 100-page limit. 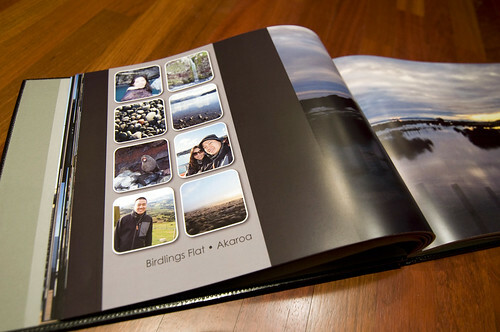 (I couldn’t squeeze all my photos into one book!) But, I guess you’d expect nothing less from PhotoBookGirl right? Although this is a two-volume series, I’ve already done two other books on my honeymoon. Check out this post, if you’re interested in seeing my earlier photo book on the Great Barrier Reef (an Aperture 3/iPhoto Review). It’s such an amazing place, the gorgeous underwater landscapes deserved their own book! I also did a beautiful honeymoon highlight book with Picaboo (check out my Picaboo Madison review). At the time I made this book, MyPublisher did not offer customizable layouts or lay flat pages. Currently the options are available for PC users but not for Mac users, so I don’t know when I’ll get around to trying out those new features. Hopefully they won’t forget about the Mac users and get their software up to date soon! (UPDATE: Mac users now have the ability to customize layouts too!) Check out this post for my review of MyPublisher’s software. Although I think MyPublisher has some of the best print quality out there, the company’s fixed templates became too inflexible for me over time. I have done several books with MyPublisher, and over time, I wanted to be able to get more creative with the page layouts. I created these layouts with QuarkXPress – a design program which allows you to create custom layouts. Adobe InDesign is also a popular option for custom layouts. Both programs can be pretty pricey though, but if you want to be able to print your books with any company out there, having external design software gives you the most flexibility. 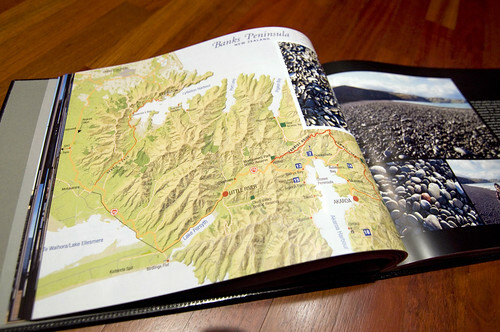 MyPublisher’s books feature a vellum overlay at the front and back. The other side of the thank you card featured photos from our wedding and a space to write a personal message to the recipient – when I get a chance I’ll post more photos of the card if you’re interested. Notice that the different chapter pages are variations on the main theme I created. You want to have variety, but you want your book to have a cohesiveness too. 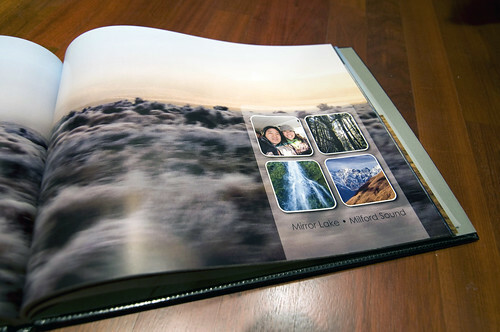 You don’t have to create 100 different page layouts to make a custom looking 100-page book. Just create a few chapter pages like mine for a custom look without a major time investment. What’s great is that I can reuse them as is or change them up a bit for future books. Below are a few custom templates I did for the interior pages. You’ll also see that I used them more than once, interspersed throughout the book. You can take a single photo and use the photo boxes to break up the photos for a different effect. 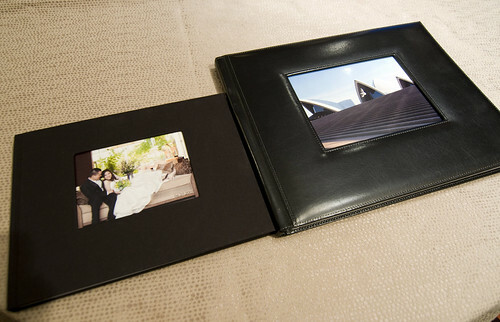 Here are two other types of custom pages, more scrapbook in style. 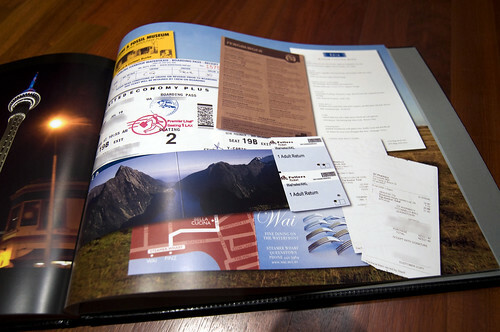 I often save ticket stubs, airline tickets, menus, maps, brochures, and receipts to scan for a personalized touch. 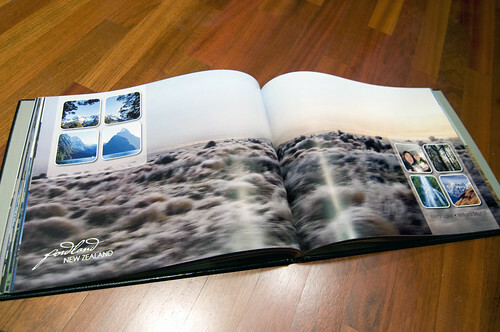 As some of you may know, MyPublisher was the first company I used to make a photo book about 5 years back. Even after trying many other photo companies, I’d have to say, that MyPublisher remains one of my favorites. Their print quality is crisp and colors come closest to duplicating what I see on my screen. I have had some consistency issues in printing with MyPublisher (in the past, I’ve had some random photos print with a red overcast, crushed pages etc.) all of which are totally unacceptable, but MyPublisher’s customer service is normally pretty easy to contact (either through chat, email or phone) and has been prompt to give full credit to print another book when printing issues have occurred. For me, calling on the phone has been the most effective and most prompt way to get an immediate response. 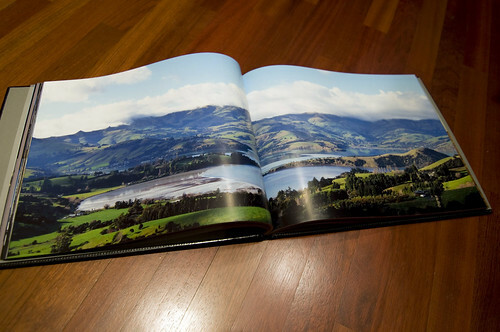 MyPublisher’s Deluxe book features the thickest and highest quality photo paper for this size book that I’ve found, which is all the more important when you’re dealing with a book of this massive. The paper is 182 lb. cover weight paper which is thicker than text weight paper. The smaller MyPublisher Classic is printed on 115 lb. 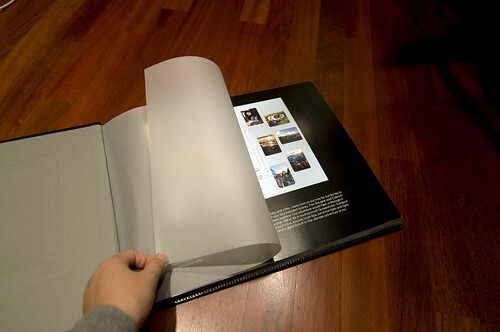 cover weight paper – a really good weight paper in itself. The smaller Classic size as compared to the Deluxe size. It may not look like a huge difference but it really is. MyPublisher’s Deluxe leather books have a small debossed logo on the rear cover. Pretty subtle, but still there, so if that matters to you, note that it is not logo-free. 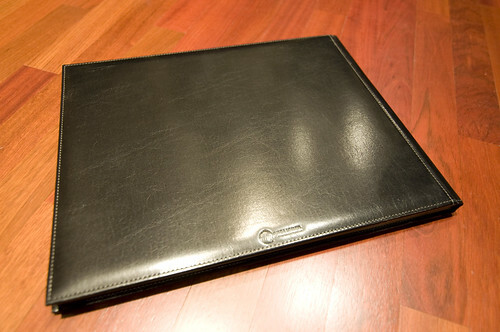 The leather version of the Deluxe book comes with a felt-like cloth protective pouch. The main reason why MyPublisher doesn’t get top marks, is their software isn’t as flexible as other companies such as Photobook America or Blurb. I wouldn’t need to use an outside design program to do these chapter pages in Photobook America or AdoramaPix for example. I can’t recall offhand whether Blurb has a rounded corner option. As I mentioned, I haven’t had the chance to use MyPublisher’s new software that allows for customizable layouts, but I’ve heard from a reader that it’s not as flexible as other companies that have customizable layouts. I’ll try to get on checking it out and I’ll update this review as soon as I do. I intend to try Photobook America’s new lustre paper option soon, as that seems to potentially be the most similar to MyPublisher’s paper. I think MyPublisher’s printing looks brighter and crisper than Photobook America’s but I wonder how much of that was affected by my decision to order Photobook America’s matte paper. So much research to do! Volume 2 of my two-volume honeymoon series is in the works. I learned from this volume 1 that it’s probably not a good idea to take a single photo and stretch it across both pages of this book. Reason is, this book is HUGE. So you can see that even if I were to push it a bit, the largest recommended width is 15.3 inches. By trying to make it work on a two-page spread of double that width, I was really pushing my luck. The pages where I did that came out pretty grainy. For volume two, I won’t do a two-page spread using the photos from this camera – the pixel dimensions just aren’t high enough to get a good clear output. Here’s a photo of a two-page spread that did work. The reason why it worked here is because I took the two halves of the photo were taken as two separate photos. When placed together, they form a single panorama. It was very unscientifically done just by shifting my camera and taking two photos. Then I placed each half on it’s appropriate side in the layout. I had to use the built-in zoom tool within the MyPublisher program to get the photos to line up. 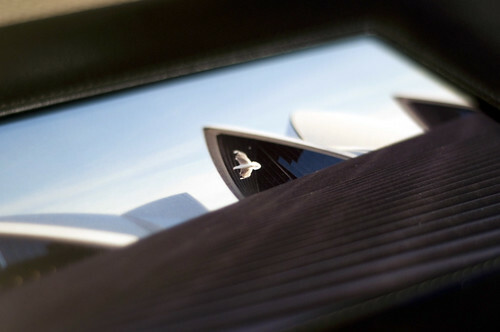 (Some cameras also have an auto-stitching function which assists you in matching the panorama photos as you take them – check your camera manual.) Because of the angle that I took this shot and the gutter, it doesn’t look like it lined up, but it actually lined up very well. 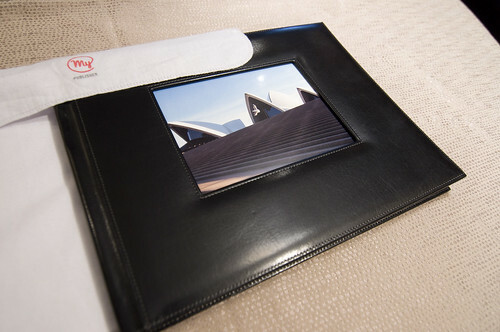 $250.00 is a good chunk of change for a photo book, but I would definitely suggest waiting for a promo. MyPublisher frequently runs deals. Just a couple days ago there was a 50% off deal that would make this book super affordable for the size and quality. Make sure to check my Coupons & Deals page often so you don’t miss the latest deal! (Better yet Fan my Facebook page or subscribe to my newsletter (look for the light blue box at top right). Would love to hear your opinion on MyPublisher – post a comment below! If you haven’t tried them yet, check out the free photo book deal for new users below! Here’s a coupon code that i just received via email from My publisher… 35. for a standard book and 70. for a deluxe book with unlimited pages. The code is LOVEIT and its good until Feb 8, 2011. Here’s another hint, if you have a coupon code that is about to expire, you can call them and ask for a “grace period” to get your book finished… I had to do this the other day. I had my book almost finished and the 60% off coupon was about to expire. They gave me another code that would continue the discount and I was able to finish that book and whip out another one before the expiration. 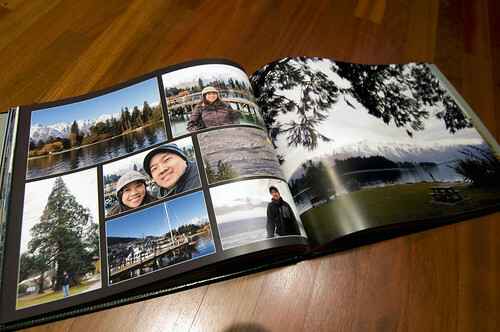 Beth, I just made my son’s 100 page deluxe photo book using the $70 coupon. There is no way any company out there can beat this price, especially considering how good their quality is…according to photobookgirl. Hopefully I won’t have the color or crushed pages. Anyways I have to thank photobookgirl for her in depth reviews. Keep it up!!! have you tried using MyPublisher’s Super Glossing Printing? what is that like? And I want to thank you for your reviews, they are wonderful! Same here! I’m a bit torn between the two! 🙂 I have a feeling I’ll go with the matte, it seems more subtle. 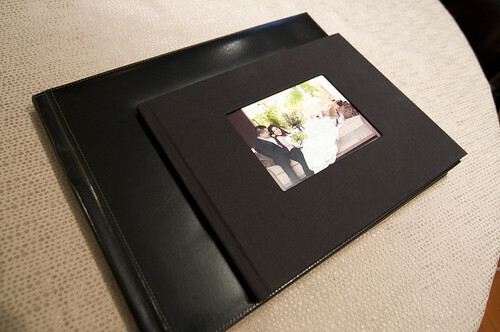 I also have another question, do you prefer MP deluxe or classic size for a wedding album? Would it be too much/overwhelming with the deluxe? The Deluxe is really nice, but it is pretty heavy – it is impressive though and the paper is a thicker, more substantial feeling paper than the classic size. If you can afford it or if this is your main wedding book, I’d go deluxe. As you can see I did my honeymoon book in Deluxe. Remember, since the pages are so big in the Deluxe, if you want you can fit more photos per page (and the photos won’t look small) so you don’t have to add as many pages. Also, matte isn’t that matte – it still has a sheen to it. It’s just not glossy. I just got a 100 page glossy paper book from MyPub and it absolutely blew me away! I’ve made at least 15 books with them and I wish they had had this service before. The colors are spectacular. The pages do show fingerprints though. I’m a very, very pleased with the results. Hope this helps. I just ordered 4 pocket-books from MyPublisher based on your recommendations; I’m guessing the quality will be very good. I’ve spent hours on your blog – thanks for all of the great info! I would like to see more content for advanced users on using programs like InDesign to create the books and the support the different publishers have. For example, Blurb and Winkflash support PDF uploads so you just have to upload one file. MyPublisher required me to export every page of my book as a JPG, then select the full-page spread for each page and assign the correct image to it. Their customer support wasn’t too impressive either – one person told me he’d never heard of InDesign before! It also took some probing to get quite vague answers about crop lines and exact size specs. I haven’t tried the pocket books personally, so it would be great to hear from you about how they turn out. I’m glad you like my blog – thanks for your comments! A post is in the works on PDF upload and on selling/marketing your book online which are aimed at more advanced users. I have a friend who is trying that whole service out. I don’t know if he’s using InDesign or just Photoshop to do the layouts. I haven’t used InDesign to make my photo books – but have used Quark as I mention. By the way, Viovio is another company in the database that allows for PDF upload… Happy photo book making! Hi – really interesting post, thanks for this. I’m going to do a large book like you in Indesign and export the jpgs into MP. It’ll be a wedding album for a couple. I just love the creativity you can use for the spreads in ID. Your book looks really brilliant, congratulations! Could I ask what page settings you used in ID? 5) I labeled them left side and right side in the title so I could easily locate it when I uploaded into MyPublisher. Sounds like a lot of work, but once you get into the workflow, it’s not bad. Plus I have the templates saved so I can use them anytime I want! Thanks for the reply, those instructions are going to help a lot – really appreciate it. ID can save each page right out to jpg which is a timesaver. Another cool feature is it can caption each image with its filename. So before I layout the images in MP I can send a pdf of the album to the couple and if they require changes there’s no mix up in identifying images. It sounds simple enough, I just hope it all goes to plan! Sounds good. b/t/w you can pay to remove the MyPublisher logo from the book and then add your own. I think that is a relatively newer option that some pros didn’t like about the company before. Hi – Thanks for the info but I don’t think you can pay to not have the embossed MP on the back of the leather album. I wish you could! Maybe you can pay to have the internal MP logo removed off the back page but the embossed leather MP logo looks like it stays! Thanks pbg, I do appreciate your help and interest. 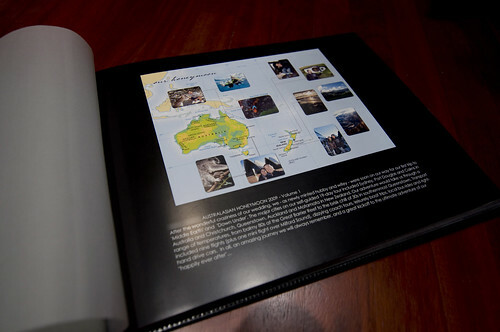 I’m in the process of making a deluxe book with MyPublisher of my 20th anniversary cruise. I loved tue map idea of the places you went to on your honeymoon, so I totally used that idea! On the map, I opened it up in photoshop and added a trail of what order and what route the ship took. Can’t wait to see how it all prints out. Many thanks for all the great reviews! While I am into exploring your website to make a decision on a couple book projects, I keep coming up with ideas which may appeal to you. 1. As I had mentioned in a prior email, your wizard technique is really appealing: a series of questions/criteria. In your case ending up with cost for size of book and some chosen features. You could make this a more robust series of criteria ending up with best companies for several features. 2. You could extend your reviews to also doing ratings of features for each company, such as rating each on quality issues: print quality, paper, binding, cover, service, etc. I like the A,B,C,D,E type school rating as most people are familiar with it: A (excellent, top quality), B (good to very good – so B+, B B- maybe), C (passable, adequate for certain types of books), D not acceptable, poor. E (optional: terrible). Might even get your followers to do their rating of companies based on their own experience. I prefer you did it as you bring much wider and more objective experience. This system makes it easier for a person to compare companies on features which are important to their book project. For example, I need to make a decision on a 200 page book full of images but also a lot of text (a tribal ethnography (I am an anthropologist) with lots of eye appeal. Obviously too expensive to be commercially viable but fine for me and some colleagues). So I narrow down to those companies who will handle this size, then look for “A” quality image printing, which paper, which cover, etc. Starting with a columned chart of company features would be appealing, then read reviews for the most likely. 3. From the pages I have seen, you are a first class book designer (and photographer). Your pages are just so creatively lovely. Maybe I missed this section in your website, but a tutorial on design would be great. #3 Thanks for the compliment! The closest thing I would have for a design tutorial are posts #7 and #8 in this “how to” series. I also usually tag those posts under “photo book tips” or “photo tips” so you may try clicking on that tag and you’ll see all the related posts pop up. 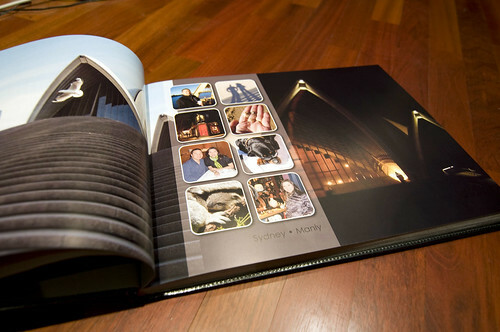 I have made 31 photo books with MyPublisher in the past 3-4 years. I am very happy with the quality of the books. I sometimes use their templates if I am in a hurry to make one of their sales. When you are paying well over $100 for a book, 40-50% off is big, especially with how many I make. I started with Kodak but I like the quality of MyPublisher much better and I can get 100 pages with MyPublisher. I make and use my own photo templates in Photoshop Elements most of the time because I find their templates very limiting. I enjoy your reviews and suggestions. I have done more than 20 books using MyPublisher – so obviously I am a happy customer. However I have one issue and that is with the zoom tool. When I click to zoom in or out the steps are irradic and sometimes huge (unlike the advertised one percent change – or 5% when holding the shift key down). If I use the slider, I find it hard to fine tune the amout of zoom. Is this problem unique to me and my computer. No one else seems to mention it as a issue. I have a fairly new computer running Windows 7 64 bits. Thanks for any thoughts. Hi Bill, I use a Mac, so I don’t know if the Mac software reacts the same as what you’re seeing when you use the Windows version. I do know the Mac version lags behind the PC version. You definitely have a lot of experience with MyPublisher. Sliders can be tricky tools as a whole – I generally prefer when the software also gives you a option to enter your own numbers as I find them more precise. I am doing my first photobook in MyPublisher, but am doing the templates in an outside program. Can anyone tell me if they’ve made the templates AND put the pictures in the templates in the outside program, THEN brought it all in as a jpeg? And if so, has the quality of the pictures when printed been good? Thank you! Hi Nicole, that’s what I did in this post – I created the whole page from scratch outside in a separate program then uploaded the completed page as a full page bleed jpeg. So, what you see here should be what you’re referring to. Came out great. Can’t tell which pages were done in the program versus brought in from outside. That’s a relief to hear! I did all the templates in an outside program, and saved them at the best dpi, etc…they look crisp and clear in my outside program, and they look great when viewed as a jpeg in something like Windows Photo Viewer. Once they’re brought into MyPublisher, however, they seem to look grainy compared to just bringing in photo using MyPublisher pre-made templates, but if you’ve had no issues, then hopefully mine will be ok?? Also, I’ve hunted and hunted, but I can’t find a way to put mats around the pictures if I use MyPublisher’s tempates (aside from the themed ones of course). Is there a way to do that? By mats do you mean frames or borders? I’m not too familiar with that particular option, but I’m also on a Mac, so if you’re on PC, the software is a little different. What dpi are you saving your layouts in? Are they at least 300 dpi? 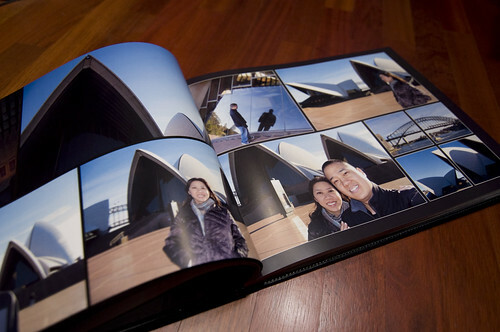 Is MyPublisher’s deluxe paper (170 lbs now, guess it used to be 182 lbs) the thickest? Does anyone else have thicker paper? Thanks! I have done books with Winkflash, Mixbook, Shutterfly and Snapfish. I tried My Publisher for the first time with a Living Social deal. 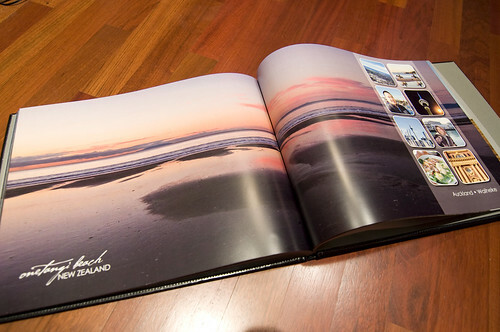 The book itself came out amazing. It is huge and the paper is much thicker then the others. 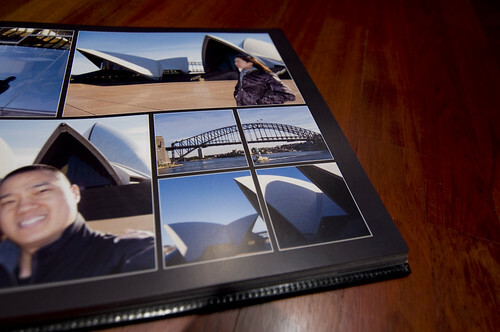 I used the high gloss finish and each page feels like a regular photograph. With that said, I had problems both creating and uploading this book. Winkflash, which does not have the option to use a photo as the page background, is my favorite. Unlike My Publisher, they have very easy easy to use everything and super competent customer service. As stated, I had a voucher for this book. When I tried to use it I got an error message that a template space was blank. It was not, but the book would not upload. I removed it, but then the voucher wouldm’t work. Customer service was not helpful and took a very long time. They talked me through it and gave me a new voucher code, but it still wouldn’t take. On the third try I had a huge argument with them because they said I would have to wait for someone to call me back. I refused to hang up and demanded, very loudly, to speak to anyone else. In the end I had to remove the whole page because no one could figure out what the problem was. In the end I got a beautiful book, but I do not think I will deal with this company again. Too much work goes into these books to have to remove and/or redo because of their software glitches. I much prefer the ease of sites where you do the work online knowing that all the work is there if there are any computer issues. Love your layouts and suggestions to make the pages in an outside program! I have a question that might be a little too detailed but for your black background, did you use a flat black like C=0 M=0 Y=0 K=100? Or some rich black formula? It looks great, I just want to make sure I’m doing it right since I’ll be uploading a single jpeg to the MyPublisher software. And then you just saved the file as a 300dpi RGB jpeg? Thanks! Yes, it was just a pure black – and I then saved as a 300dpi RGB jpeg. You’re right! Thank you so much for all of your tips and information, I am following your site closely as I complete my first photobook canada book for my baby’s first year! I was just wondering how you did the transparent “background” under your smaller photos on your chapter pages, ie. Queenstown- it gives such a nice effect! 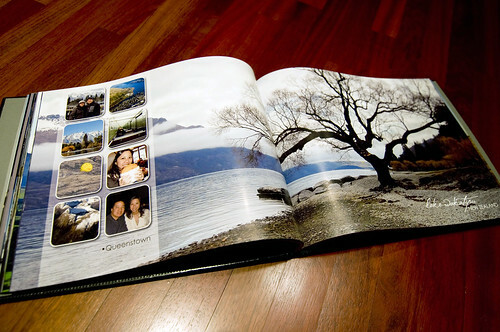 You can do the same in Photobook Canada – they have really flexible software. I think I made a text box and then filled it with a color. Then I lowered the opacity. I just didn’t put any text in it. Hope that helps! I’m running into the same problem as you with mypublisher, their software is so slow and annoying. I wanted to do 2 page spreads with this book, with lay flat pages and full bleeds, could you give me the page specs you used? I just use the actual dimensions of the end page itself. I always do a test page before working on the rest. I don’t like worrying about technical stuff, so this has been my best solution for myself. Just make a test page and don’t worry too much about numbers. In their privacy statement they say they have the intellectual rights to any images uploaded using their software? Am I reading that right? I haven’t had a chance to look at them recently, but it’s a common statement made by lots of social media as well. So, you are probably reading that right.